The Polishing Pad is an open cell polyester foam pad that works with your milder finishing compounds to provide unparalleled polishing and finishing results. The wide bite and fine cells mean that compound stays where the work is being done and that you polish and finish all of your work quickly and uniformly. We recommend the BuffPro® Polishing Pad with polishing compounds for light scratches, haze, and minor imperfections in gel coat or paint. This pad can also be used on stone, fully-cured primed or painted metal, soft body compounds, and bringing raw metal to a high-gloss finish. Designed for extended professional use, these pads easily wash out with soap and water and resist being saturated with compound. The Finishing Pad is an open cell polyester foam pad that works with your mildest finishing compounds to provide unparalleled final finishing results. The wide bite and fine cells mean that compound stays where the work is being done and that you finish all of your work quickly and uniformly. We recommend the BuffPro Finishing Pad for final polishing, glazing or as a one step wax cleaner. 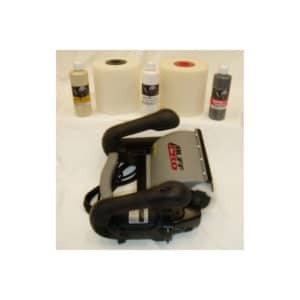 This pad can also be used on stone, fully-cured primed or painted metal, soft body compounds, maintenance on gel coat, finish work and bringing raw metal to a high-gloss shine. The Heavy Cutting Wool Pad, is a fine wool material over a foam pad that works with your most aggressive compounds to provide unparalleled cutting power. The compound stays where the work is being done and that you even out your roughest areas quickly and uniformly. The Luster Polishing compound is ideal for ceramic paint and conventional clear coats. Use it with a BuffPro Finishing or Polishing Pad to remove light imperfections, holograms, 2500 grit sanding marks and mild oxidation. Upon completion, the vehicle will reveal a mirror-like shine. The Pearl Polishing Compound is a heavy duty polish that restores aged or weather-beaten paint. For use on any type of paint, it removes 1000-1500 grit wet sanding marks, swirls and paint oversprays. 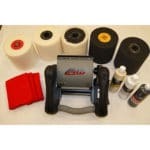 Use with a BuffPro Polishing Pad for superior results. Most vehicle exterior detailing jobs can be completed with the BuffPro Amber and a wax step for finishing. Use with a BuffPro Wool or Polishing Pad to remove moderate to mild swirls, water spots, light scratches and other mid-range imperfections. Use to polish light flaws and amplify the paint's gloss. With the Heavy Cut Wool Pad, the BuffPro Amber will quickly restore headlights with a little effort.